Spring 1832: Donegal, north west Ireland. Coll Coyle wakes to a blood dawn and a day he does not want to face. The young father stands to lose everything on account of the cruel intentions of his landowner’s heedless son. Although reluctant, Coll sets out to confront his trouble. And so begins his fall from the rain-soaked, cloud-swirling Eden. Summer 1832: Duffy’s Cut, west of Philadelphia. After an epic voyage across the Atlantic, an emaciated Coll looks from hollowed eyes at the hill he and fifty-six other sick Irish immigrant workers must level to make way for the locomotive line. In front of him is a short life of backbreaking toil and personal regret. Behind him is John Faller – a man who has vowed to hunt Coll to the ends of the earth. 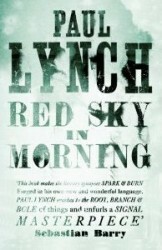 Red Sky in Morning is a dark tale of oppression bathed in sparkling, unconstrained imagery. A compassionate and sensitive exploration of the merciless side of man and the indifference of nature, it is both a mesmerizing feat of imagination and a landmark piece of fiction.